Piñero contrasted the wave of postwar immigration with Puerto Rico’s dependent status. After observing, “One half of the world’s population is made up of dependent peoples under some form of colonial rule,” Piñero noted that colonial powers such as France and Great Britain had relinquished some control to their colonies. Piñero judged the United States’ relationship with Puerto Rico to be ironic. “In view of our own origin as a free nation, we today hold sovereignty over dependent peoples, all of them American citizens, but denied the rights that American citizenship symbolizes to the rest of the world,” he said. Piñero characterized U.S. sovereignty over the territories as benevolent, but noted, “Benign rule does not excuse our failure to live up to our American principles of granting the fullest enjoyment of … democracy to all citizens under the Stars and Stripes.”28 Although the Tydings–Piñero bill died in committee, the idea of a plebiscite to determine the structure of Puerto Rico’s government persisted, culminating in the passage of the Elective Governor Act in 1947. Piñero was sworn in as governor on September 3, 1946. A contemporary observer noted that Piñero was “considered by most Puerto Ricans as an interim governor, holding office only until the people achieve their long-cherished ambition to determine their permanent political status by … plebiscite.”33 One of Piñero’s major legislative achievements was the passage of the Elective Governor Act (61 Stat. 770) in August 1947. The statute enabled Puerto Ricans to elect a governor by popular vote in the 1948 election cycle. Submitted by Fred Crawford of Michigan, H.R. 3309 met with little opposition in Congress. President Truman called the bill “a great step toward complete self-government,” saying, “I sincerely hope that the action of the Congress will meet with the approval of the people of Puerto Rico.”34 Piñero and his successor, Antonio Fernós-Isern, attended the signing ceremony along with Crawford and a number of other government officials.35 The act enabled Luis Muñoz Marín to run successfully for a four-year term as Puerto Rico’s first elected governor. 1“Yo quiero hacer claro ante ustedes … que al representarlos a ustedes en Washington cumpliré la misión que el pueblo me encomienda.… Yo no he solicitado la encomienda … La acepto porque es deber mío … y porque amo la oportunidad de servir al pueblo.” “Jesús T. Piñero, candidato Popular para Comisionado Residente,” 5 November 1944, El mundo (San Juan, PR): 7. Translated as “Jesús T. Piñero, Popular Candidate for Resident Commissioner” by Translations International, Inc. (July 2011). 2Olga Jiménez Wagenheim, “Piñero, Jesús Toribio,” American National Biography 17 (New York: Oxford University Press, 1999): 542–543 (hereinafter referred to as ANB); Teofilo Maldonado, “Piñero dice su labor primordial sera hacer que el pueblo Americano comprenda bien al nuestro,” 3 December 1944, El mundo: 7. For an extensive history of the Piñero family, see Jaime Partsch, Jesús T. Piñero: El exiliado en su patria (Rio Piedras, PR: Ediciones Huracán, 2006): 14–18. 3Wagenheim, “Piñero, Jesús Toribio,” ANB. 4Wagenheim, “Piñero, Jesús Toribio,” ANB; César J. Ayala and Rafael Bernabe, Puerto Rico in the American Century: A History since 1898 (Chapel Hill: University of North Carolina Press, 2010): 100–101. For more information about Munoz Marín, see Olga Jiménez Wagenheim, “Muñoz Marín, Luis,” ANB 16 (New York: Oxford University Press, 1999): 99–100. For a more extensive biography, see A. W. Maldonado, Luis Muñoz Marín: Puerto Rico’s Democratic Revolution (San Juan: Editorial Universidad de Puerto Rico, 2006). 5Wagenheim, “Piñero, Jesús Toribio,” ANB. 6Ayala and Bernabe, Puerto Rico in the American Century: 136–138, 142–144. 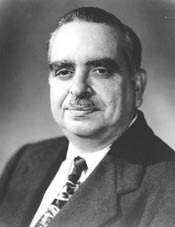 For a detailed explanation of the 1940 election, see Fernando Bayron Toro, Elecciones y partidos políticos de Puerto Rico, 1809–2000 (Mayagüez, PR: Editorial Isla, 2003): 191–197. 7Wagenheim, “Piñero, Jesús Toribio,” ANB; Partsch, Jesús T. Piñero: El exiliado en su patria: 66. 8Partsch, Jesús T. Piñero: El exiliado en su patria, 66–70. 9For a description of Piñero’s nomination in English, see Ayala and Bernabe, Puerto Rico in the American Century: 153–154; and Rexford G. Tugwell, The Stricken Land: The Story of Puerto Rico (New York: Greenwood Press, 1968): 664. For detailed descriptions of Piñero’s nomination in Spanish, see Partsch, Jesús T. Piñero: El exiliado en su patria, 70–75; and “Populares postulan a Piñero para comisaria,” 21 August 1944, El mundo: 1, 4, 21. 10“Tiene un conocimiento íntimo de los procedimientos, las maneras, los metodos que con mayor exito pueden emplearse en Washington en beneficio del pueblo de Puerto Rico … merece la entera confianza del pueblo de Puerto Rico; saben que no violará ningún compromiso contraído por su partido con el pueblo de Puerto Rico, tanto el mandato económico que ha de dar.” “El candidato a Washington, Jesús T. Piñero,” 2 September 1944, El mundo: 1. Translated as “The Candidate to Washington, Jesús T. Piñero,” by Translations International, Inc. (July 2011). 11“Es hombre de tendencias francamente conservadoras. Unionista y luego liberal, su actitud corresponde en términos generales a la de un conservador del republicanismo a ultranza.… No es Piñero figura de relumbrón. Modesto y desinteresado, su obra la hace en silencio, con probidad plausible, propia de un hombre que se debe a su partido y a su pueblo y le sirve con marcada devoción.” Wilfredo Braschi, “Dos candidatos,” 13 September 1944, El mundo: 2. Translated as “Two Candidates,” by Translations International, Inc. (July 2011). 12“El principio de que el Gobierno Federal suministre cierta ayuda económica y financiera al pueblo de Puerto Rico es un principio de responsibilidad y de justicia, en vez de ser un principio de mera caridad o sencilla dádiva o de favores que se quiere buenamente hacer.… Muchos de nuestros amigos en Washington … no comparten este criterio … su actitud, con toda sinceridad y con toda buena fe. Pero hay que irles demostrando que, mientras el pueblo de Puerto Rico necesite ayuda, por … esa ayuda se debe considerar como un derecho; no como un derecho que se reclama a rajatabla con riesgo de crear prejuicio contra él, sino como un derecho sobre el cual se llega a acuerdos dentro de un procedimento de amistad, de convencimiento, de comprensión y de mútua buena fe.” “Piñero expone la labor hará en Washington,” 31 October 1944, La democracia (San Juan, PR): 1, 5. Translated as “Piñero Explains What Work Will Do in Washington,” by Translations International, Inc. (July 2011). 14“Ser la presencia de Muñoz en Washington; crear una imagen positiva del Partido Popular y su labor en la isla; y evitar a toda costa que se desarrolle ninguna polémica sobre el tema de la situación política de Puerto Rico.” Partsch, Jesús T. Piñero: El exiliado en su patria: 78. Translated as “The Commissioner’s Agenda,” by Translations International, Inc. (July 2011). 15David T. Canon et al., eds., Committees in the U.S. Congress, 1789–1946, vol. 3 (Washington, D.C.: CQ Press, 2002): 830; Charles Stewart III, “Committee Hierarchies in the Modernizing House, 1875–1947,” American Journal of Political Science 36 (1992): 845–846. Piñero’s committee assignments varied widely in terms of their attractiveness to Members. According to Stewart’s ranking of the desirability of 69 committees from this time period, Piñero’s assignments to the House Committees on Naval Affairs and Agriculture ranked highest (7th and 8th, respectively). Military Affairs ranked 13th, Labor ranked 19th, Insular Affairs ranked 23rd, Mines and Mining ranked 25th, and Territories ranked 29th. 16“Piñero prestara hoy juramento come comisionado en Washington,” 3 January 1945, El mundo: 6. 17“La cooperacion de Piñero para los veteranos,” 2 January 1945, El mundo: 1, 16. 18One of Piñero’s early initiatives was the creation of an insular office that would plead Puerto Rico’s case beyond the halls of Congress. For more information about this, see “Piñero hacia Washington en mes diciembre,” 14 November 1944, El mundo; Charles McCabe,“Emilio Colon designado para la oficina insular en Washington,” 17 September 1945, El mundo; “Oficina en Wáshington estará establecida en mes diciembre,” 16 November 1945, El mundo. 19For an example of Piñero’s interest in protecting the Puerto Rican sugar market, see “Piñero escribe a la OAP y CCA sobre el azucar,” 31 January 1945, El mundo: 14. For examples of Piñero’s securing airline routes between Puerto Rico and the United States, see “Lanzaran un ataque contra las tarifas de la Pan American,” 2 April 1945, El mundo: 1, 15; Ruth Broom, “Piñero procura contactos con la Cia. Grace,” 4 November 1945, El mundo: 1, 3. Piñero also sought money for Puerto Rican farmers. For example, see Jean Van Vraken, “Piñero urge aprobacion de los fondos para extension agricola,” 16 February 1946, El mundo: 1, 24. For information about Piñero’s investigation of Puerto Rican soldiers’ forced labor alongside Japanese prisoners of war in Hawaii, see Charles McCabe, “Piñero urge se investigue el caso de puertorriqueños en el Hawaii,” 11 December 1945, El mundo: 1, 14. 20Congressional Record, Index, 79th Cong., 2nd sess. : 640, 657. Piñero submitted H.R. 5975, a bill to amend the Nationality Act of 1940 to preserve the citizenship of a Puerto Rican born outside of the United States, and H.R. 6701, a bill to preserve the nationality of citizens residing abroad. Both bills died in committee. 21Ibid., 668. Piñero also advocated for voting representation for the Virgin Islands. See J. T. Piñero, “Virgin Islands,” 27 March 1946, Washington Post: 8. 22Ayala and Bernabe, Puerto Rico in the American Century: 156; Congressional Record Index, 79th Congress, 1st sess: 757, 777, 886. For information about the deliberation and submission of H.R. 3237, see “Pedira el plebiscite la Comision Legislativa,” 5 May 1945, El mundo: 1, 16. For a contemporary analysis of the bill, see Luis Muñoz Morales, “El Bill Tydings–Piñero; Alternativas-Plebiscito,” 3 June 1945, El mundo: 9. The bill was popularly known as the Tydings–Piñero Bill. 23Congressional Record, House, 79th Cong., 1st sess. (16 May 1945): 4660. 24Charles McCabe,“No habra audiencias por ahora sobre el Bill Tydings–Piñero,” 6 June 1945, El mundo: 1, 18. Congress considered three bills that called for greater political autonomy for Puerto Ricans: the Tydings plebiscite bill; the Tydings–Piñero Bill, advocating three solutions (H.R. 3237); and a bill authored by Vito Marcantonio of New York (H.R. 2781), advocating full independence. Marcantonio’s bill died in committee. For a description of the bill, see Congressional Record, Index, 79th Cong., 1st sess. : 875; Ruth Broom, “Bill de Piñero detenido en el Comite Camara,” 18 July 1945, El mundo: 2, 3. 25J. T. Piñero, “Puerto Rico to Test U.S. Policy,” 20 May 1945, Washington Post: B3. 26“Piñero visito ayer al Pres. Truman,” 22 August 1945, El mundo: 1, 6. During a 15-minute meeting, Piñero told Truman that the Puerto Rican legislature had voted on two occasions to dissolve the current form of government and that its intention was to decide how the government would be run in the future. Piñero said Truman was sympathetic to Puerto Ricans’ point of view. 27Harry S. Truman, “Special Message to the Congress on Puerto Rico,” October 16, 1945, in John T. Woolley and Gerhard Peters, The American Presidency Project [online]. Santa Barbara, CA, http://www.presidency.ucsb.edu/ws/?pid=12314 (accessed 19 July 2012). 28Congressional Record, House, 79th Cong., 2nd sess. (19 March 1946): 2424. Piñero submitted an editorial about Puerto Rico’s status and, one week earlier, a critique of U.S. rule as an editorial in the New York Times. See Congressional Record, Appendix, 79th Cong., 2nd sess. : A1490–A1491. 29For more information about Krug, see “Ex-Interior Secretary Dies,” 28 March 1970, Washington Post: B6; and “J. A. Krug, 62, Dies; Was Truman Aide,” 28 March 1970, New York Times: B6; “For Piñero as Governor,” 10 July 1946, New York Times: 44. 30“Me siento profundamente honrado, y acepto con la mayor humildad la designación que me han otorgado hoy el Presidente de los Estados Unidos.… Si el nombramiento es confirmado por el Senado de Estados Unidos, me encomendaré a la Divina providencia pare que me guíe y pediré la cooperación de todo el pueblo de Puerto Rico para asi servir mejor tanto los intereses del Gobierno Federal como los del pueblo de mi Isla.” Jean Van Vraken, “Piñero recibió el nombramiento con su característica modestia,” 27 July 1946, El mundo: 1. Translated as “Piñero Received the Appointment with His Characteristic Modesty,” by Translations International, Inc. (August 2011). For a positive contemporary reaction to Piñero’s nomination, see E. L. Bartlett, “Piñero ‘Appointment,’” 1 August 1946, Washington Post: 6. Bartlett, a House colleague of Piñero’s, served as Territorial Delegate to Alaska. 31The editors also hoped Piñero’s “public management can result in a new era of civil achievements for the community” while eschewing political partisanship from the PPD. The editors warned, “It is necessary to think not only of the great responsibility that the party that is in power will assume.… By claiming partisan loyalties, the Popular Democratic Party will push Mr. Piñero toward partiality, privilege and favoritism … then its failure of the recognition that has been given to Puerto Rico would not come as a surprise.” However, if the PPD “is willing to provide facilities for a better government … and positions itself in a generous and honest position of Puerto Ricanism, then it must contribute powerfully to the triumph of Mr. Piñero in this difficult mission.” “Debemos interpretarlo como un inicio del reconocimento de nuestro derecho al gobierno propio y una demostración de fe en nuestra habilidad para regir nuestros propios asuntos. En tal sentido, el acontecimiento merece la distinción de figurar entre los principales jalones de nuestra historia … ser precursor de otras medidas definitivas en relación con el status político de Puerto Rico … a la esperanza de que su gestión pública pueda resultar en una nueva era de realizaciones cívicas para la comunidad … hay que pensar no solo en la gran responsibilidad que en ello tendrá el gobernador Piñero, sino también en la gran responsabilidad que asumirá el partido que está en el poder.… Si reclamando lealtades partidaristas, el Partido Popular Democrático empujara al señor Piñero a la parcialidad, al privilegio y al favoritism … entonces no habrían de extrañar su fracaso y el fracaso del reconocimento que se le ha hecho a Puerto Rico … el partido en el poder se dispone a brindar facilidades para una mejor obra de gobierno, y condena y destruye las malas prácticias y se sitúa en generosa e íntegra posición de portorriqueñismo, entonces habrá de contribuir poderosamente al triunfo del señor Piñero en su difícil encomienda.” “El nombramiento de Piñero,” 26 July 1946, El mundo: 6. Translated as “Piñero’s appointment” by Translations International, Inc. (August 2011). 32“Mayor to Greet Piñero,” 26 July 1946, New York Times: 47; “Piñero Is Honored at City Ceremony,” 26 August 1946, New York Times: 23. 33“Puerto Rico Hails Governor Piñero,” 4 September 1946, New York Times: 35; Paul Blanshard, “Puerto Rico Moves a Step Ahead,” 4 August 1946, New York Times: 92. 34Harry S. Truman, “Letter to Governor Piñero of Puerto Rico upon the Signing Bill Providing for an Elected Governor,” in John T. Woolley and Gerhard Peters, The American Presidency Project [online]. Santa Barbara, CA, http://www.presidency.ucsb.edu/ws/?pid=12725 (accessed 18 April 2011). 35C. P. Trussell, “President Enacts Puerto Rico Poll,” 6 August 1947, New York Times: 20. 36Wagenheim, “Piñero, Jesús Toribio,” ANB. 37For examples, see “Piñero Cites Gains by Puerto Ricans,” 23 July 1948, New York Times: 7; “Puerto Rico ‘Letter’ Seeks New Industry,” 3 August 1948, New York Times. 38Wagenheim, “Piñero, Jesús Toribio,” ANB; “Jesús T. Piñero falleció a los 55 mientras dormía,” 20 November 1952, El mundo: 1, 12; Biographical Directory of the United States Congress, “Jesús T. Piñero,” http://bioguide.congress.gov. Papers: In the colección Jesús T. Piñero. Collection includes audio and video of oral histories, photographs, films, and documents. An inventory is available online. Partsch, Jamie. Jesús T. Piñero: El exiliado en su patria. Rio Piedras, P. R.: Ediciones Huracán, Inc., 2006. "Jesús T. Piñero" in Hispanic Americans in Congress, 1822-2012. Prepared under the direction of the Committee on House Administration by the Office of the Historian and the Office of the Clerk, U.S. House of Representatives. Washington: Government Printing Office, 2013.